Wood interiors make us think of cozy cabins and chalets tucked in the mountains. It's a strong design element that brings warmth and richness to a home. Today we’ll tour a home that’s giving new meaning to wood interiors. 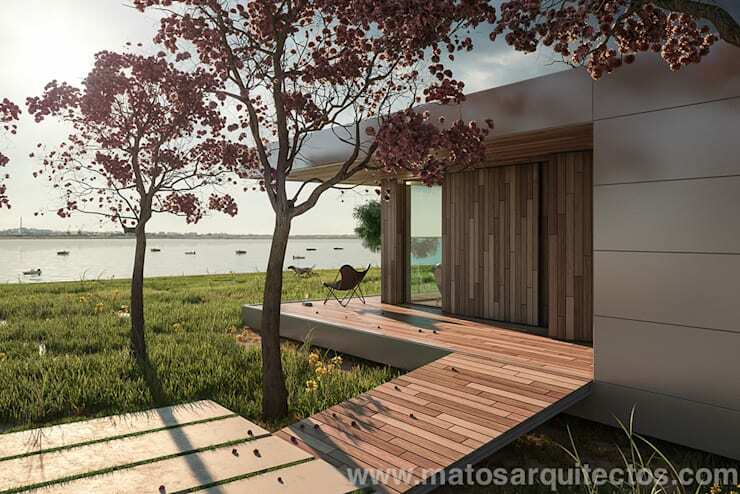 Architects designed a home where wood hugs and envelopes each room with luxurious textures and colours. Let’s take a look now and start our tour of the home that’s redefining wood interiors. This one story home has a long and linear layout. 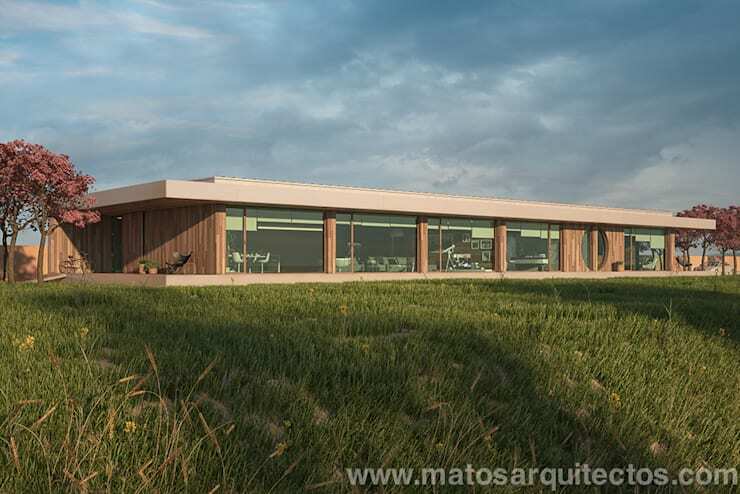 One side is opened to the landscape by panoramic windows. From the exterior, the strength of the home’s style lies in its simplicity. It exudes coolness and modernity. Take a look at the wood paneling on the exterior of the home. It’ll look familiar once we step inside! 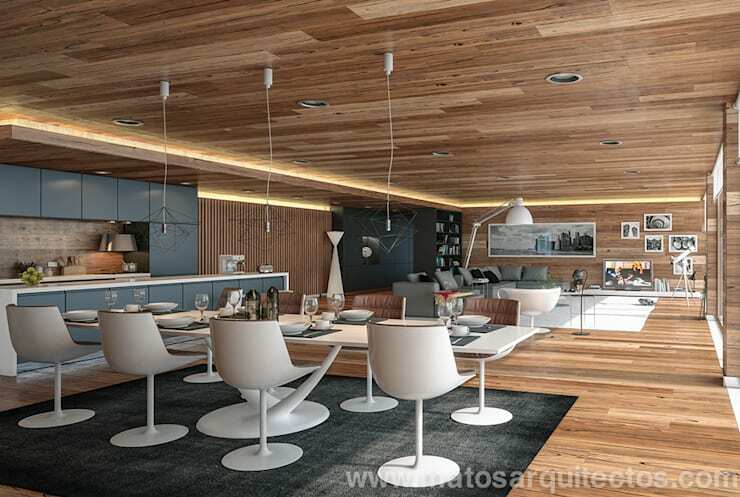 The home features an open plan design for the kitchen, living, and dining spaces. 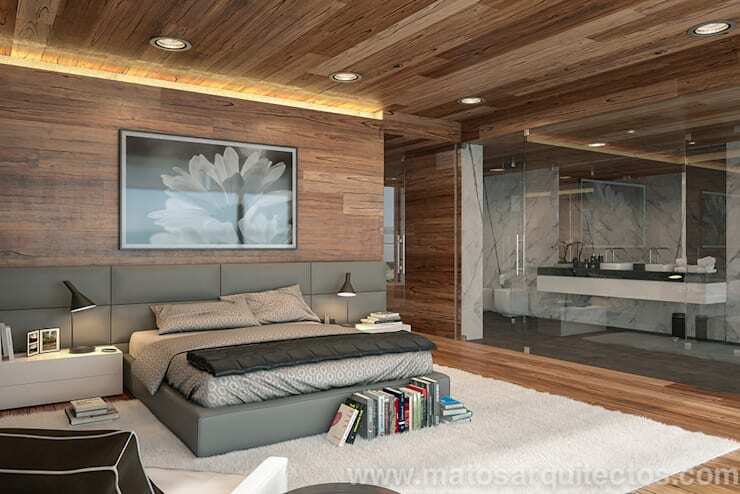 The first thing we notice about the interiors is that they are resplendent with wood! 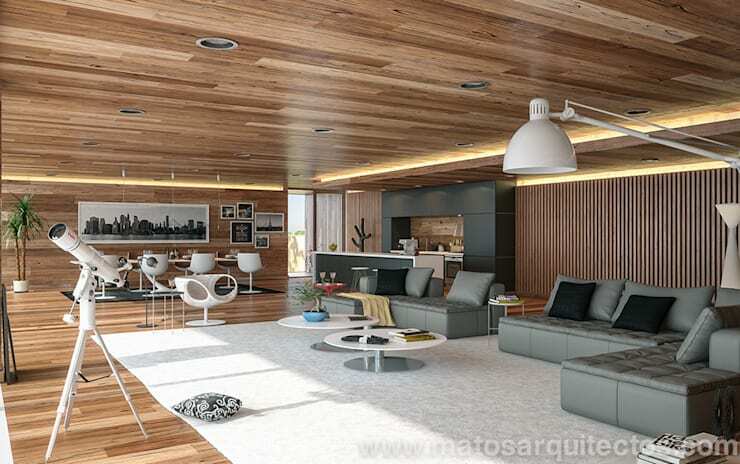 From the floors to the ceiling, wood paneling wraps the home. 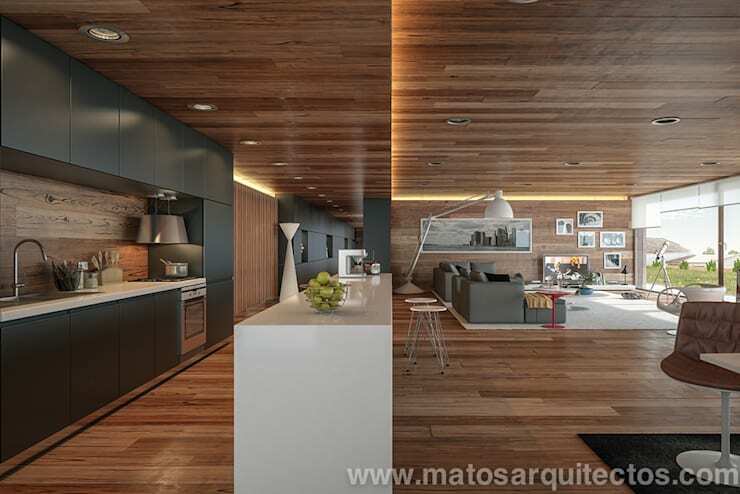 We will see this cool-toned colour palette of natural wood paired with greys and blacks throughout the home. The dining area sits next to the kitchen and has space enough for eight people to have a sit-down dinner. The retro-modern style of furniture gives the home a contemporary touch. Simple wire-frame pendant lights hang from the ceiling to illuminate meal time. We love the bold and simple style of the room! The living area of the home is meant for lounging and taking in the views outside. The look here is more casual and the low furniture gives the room a sense of ease. 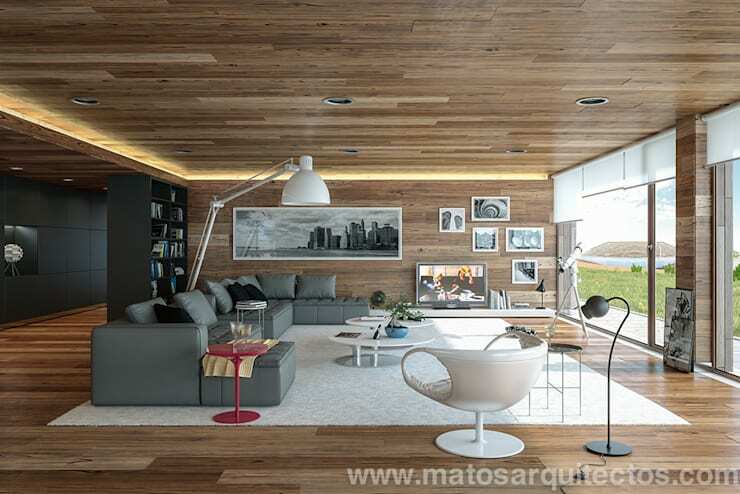 Plentiful natural light helps brighten up the look of the wood interiors. The LED lighting tracks help to make the ceiling look higher and bring more light into the space. Anywhere you look in this room there is something new to catch the eye. We love the cabinetry in the kitchen that seems to jut out from the wall. It helps delineate the kitchen in the open plan room. New textures from wood come into play. The many narrow planks bring more modern freshness into the design. Let’s sneak off to look at the bedroom. It also features an all-wood interior. It's softened by the grey and white tones in the wood. Check out the headboard and area rug. Luxe texture makes a bedroom feel extra cozy! The style here is more Scandinavian and simple. Next to the bedroom is a bathroom behind a glass wall. We love the look of this bedroom because it is stylish and comfortable. 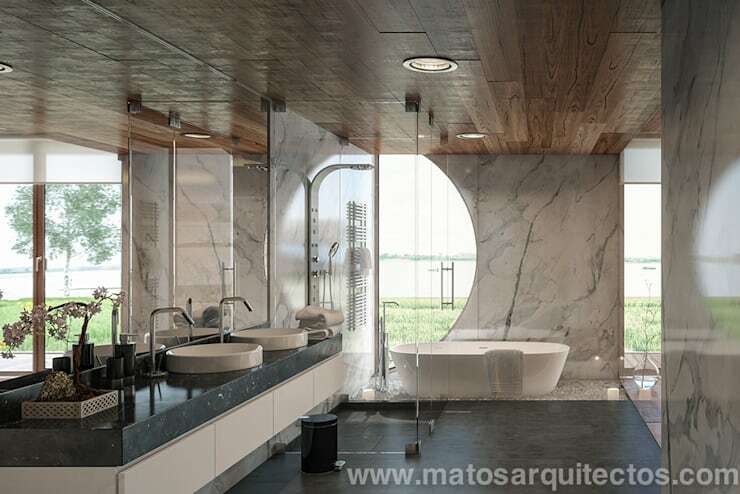 The bathroom has gorgeous marble walls that break up the wood interiors. Dark floors and countertops bring elegance to the space. What the bathroom lacks in privacy, it makes up for in high style. It’s the kind of bathroom we expect to find in a luxury hotel. The best homes elevate the everyday to the extraordinary. This bathroom is definitely able to do that! Wood you like to stay? We’ll end our tour on the terrace just outside the home. We spent a lot of time talking about the interiors. Let’s not forget that on the outside, there’s a gorgeous balance to the architecture. We would love a stay at a home like this! We hope you enjoyed our tour of this inspirational home! It’s making us rethink what we know about wood design! For more wood inspiration, check out our feature on 10 unforgettable wood-rich houses. What do you think of the all-wood look?